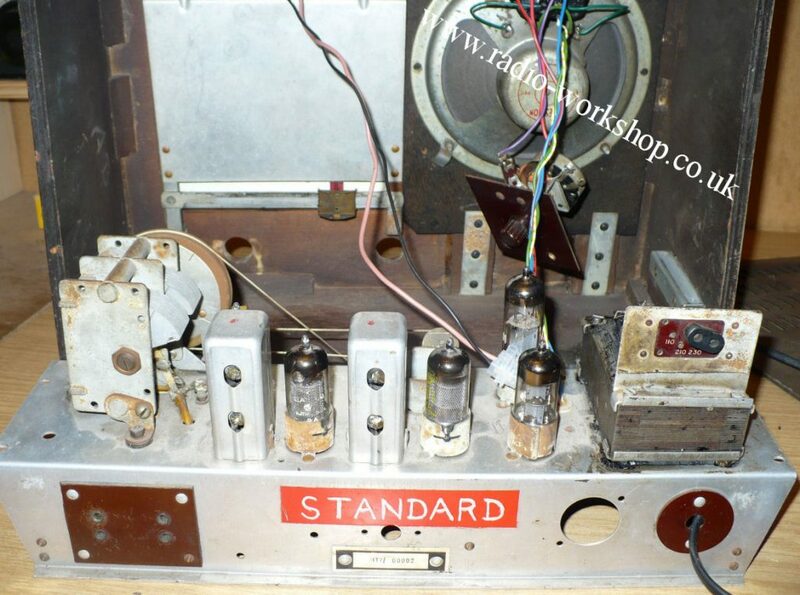 This export models look like the standard DAC90 radio, as can be seen from the illustration on the left. The giveaway is the tuning dial which includes the short wave bands, and aerial and earth sockets on the rear of the radio. 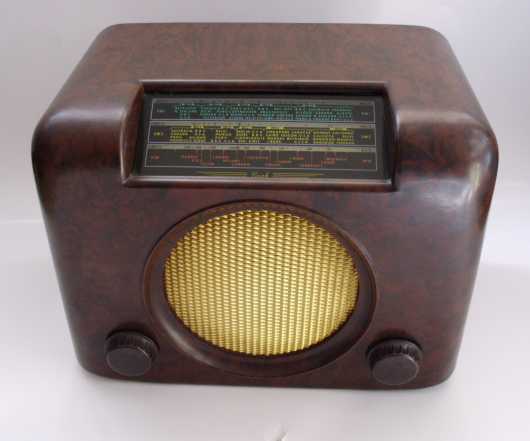 Bush did manufacture a model covering short wave for the UK market. This was the AC91, which also looks like the DAC90. There is also an export model EU3A which looks like the DAC90A radio with the wave change switch on the right-hand side. This radio has a two short wave bands and aerial and earth sockets. See the photos below which were kindly sent to me by Kevin from Dublin. I’m working on finding information about the Bush EU23 radio which looks like a DAC10. The four push buttons on the EU23 aren’t for preset stations as with the DAC10. They are in fact wave change switches, three short wave bands plus medium wave. If anyone can help with the service manual or other information, I’d very much appreciate it. I now have a set of original service manuals for the Bush Radio models EAC91, EBS3, EU3 and EU91 which I am in the process of scanning and placing on the web site here. Also, I need some help with the export model numbers. Does anyone know what the letters stand for in EBS3? The letter E presumably stands for export but what about the B and S? Please email me if you have any ideas. The Bush EBS31 export radio photos are above. What does the “STANDARD” label mean which has been painted on the rear of the chassis? If anyone knows, please tell me. 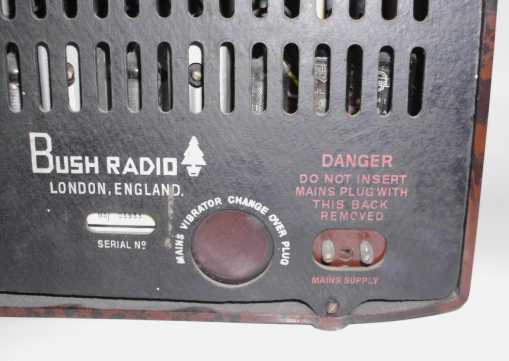 Bush manufactured a number of radios which were intended for export only. They differed from the UK models in ways such as mains voltage and other slight variations, but the main difference was the bands they covered. Very few countries used the long wave band, so that was omitted from export models. 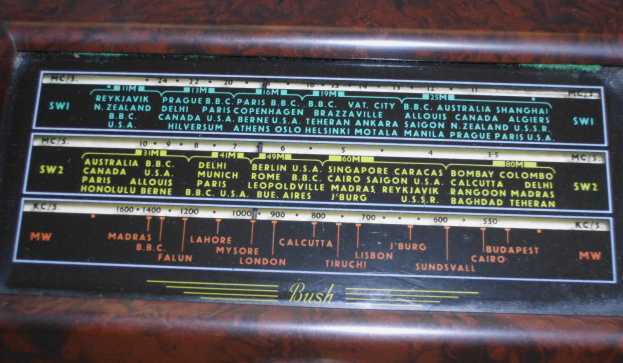 Medium wave was used in many countries and was included on the radios. However, due to massive electrical storms in the tropics which caused horrendous interference, many tropical radio stations used the short wave bands where the effect of such storms was far less severe. These were known as the Tropical Bands and they covered 2.300 Mc/s to 2.495 Mc/s. 3.200 Mc/s to 3.400 Mc/s and 4.750 Mc/s to 5.060 Mc/s. There were, and still are, some stations which broadcast outside these internationally accepted bands. For example, many tropical stations transmit in the 5.200 Mc/s to 5.700 Mc/s band. The Tropical Bands still exist today and some good DX can be heard under the right conditions. As it happens, these radios covered the Trawler Band, which was around 2 to 3 Mc/s and several amateur bands, so they were ideal for short wave listeners. 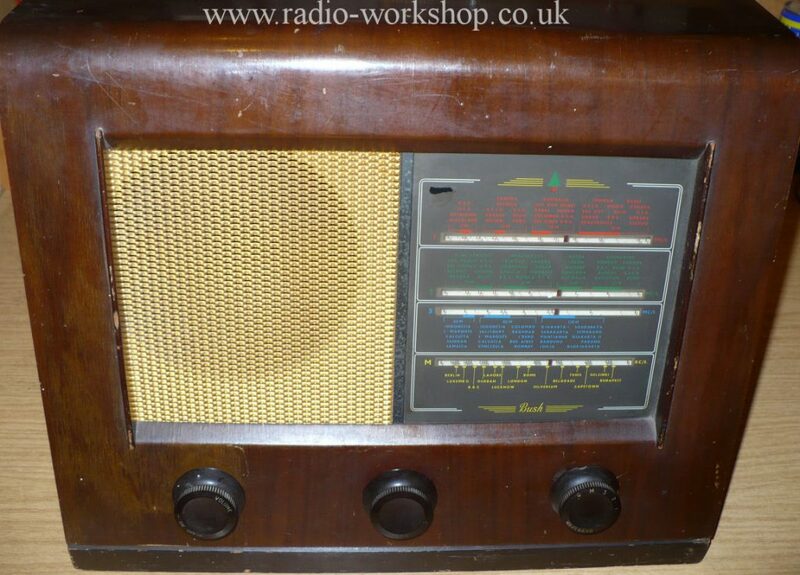 However, the radios were difficult, if not impossible, to get hold of in Great Britain. Interestingly, I’ve had emails from as far afield as South Africa and India from people who either still have or remember having these radios. if there are any going spare, please send them my way!